Nancey Green Leigh, a member of the LAI Atlanta Chapter, hosted our lunch meeting on Tuesday, May 16, 2017. It was held at the Georgia Institute of Technology (Georgia Tech). Nancey is the Associate Dean for Research in the College of Design; a professor in the School of City and Regional Planning; adjunct professor in the School of Public Policy; and an affiliate of the Institute of Robotics and Intelligent Machines Georgia Tech. She has a PhD Degree in City and Regional Planning and a Masters in Economics from the University of California at Berkeley, and a Masters in Regional Planning from the University of North Carolina at Chapel Hill. 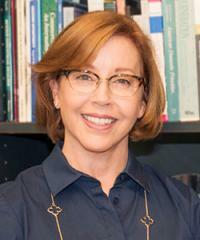 Nancey is a Fellow of the American Institute of Certified Planners (FAICP). Her research and teaching specialization is economic development planning. Currently, Nancey is leading a National Science Foundation project, entitled “Workers, Firms and Industries in Robotic Regions,” which is funded by the National Robotics Initiative. Those at the meeting had an interesting and spirited conversation about how computers, technologies and robotics have impacted advanced manufacturing industries. 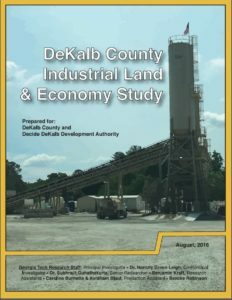 Nancey recently completed a study about manufacturing and industrial preservation, entitled DeKalb County Industrial Land and Economy Study (August 2016) for DeKalb County and the Decide DeKalb Development Authority. This study was well-received, and DeKalb County is working to implement its recommendations. Nancey presented a summary of the results and conclusions from this report at the LAI Atlanta lunch meeting. The findings of the study are based on input received from stakeholder interviews and two focus groups; windshield surveys of manufacturing and industrial sites and buildings in DeKalb County; and additional research conducted by Nancey and her Georgia Tech team. The highlights from the DeKalb County Industrial Land and Economy Study follow. Nancey’s presentation began with an overview about manufacturing and other production technologies and how these are undergoing change in the 21st century. Computers, technologies and robotics have impacted advanced manufacturing industries. Workers now need to be educated and trained so that they have the skills to be productive and work in today’s advanced manufacturing facilities. Manufacturing is producing new, small batch, custom built products, and the “Maker” movement is becoming more popular. In addition, scientists, engineers and other professionals are identifying means for producing structures and materials at the nano-scale. The report completed for DeKalb County takes a broad look at the manufacturing economy and addresses it from the broader scale of “PDR,” which means Production, Distribution and Repair. According to the study,…”By defining manufacturing this way, it recognizes manufacturing is not an isolated activity, but part of an ecosystem that requires local, regional and international distribution and repair networks to thrive.” The broader PDR structure also helps to alleviate the negative image of manufacturing. DeKalb County has an industrial heritage in the Atlanta MSA, and it continues today. While manufacturing has increased throughout the U.S. and in other locations in the Atlanta Region, De Kalb County has lost both companies and jobs. Between 2009 and 2014, total PDR employment in DeKalb County decreased from 62,000 to 53,000, a 14% decline. The report identifies 13 recommended specific actions to improve DeKalb’s industrial land and enhance its competitiveness of its PDR business. These same strategies should also help the County retain its advanced manufacturing businesses, attract new prospects and investment, and foster internal expansion. The final important recommendation is to create a DeKalb Industrial Development Council, which is the organizational hub that is able to implement the recommended actions and strategies and to conduct industrial analysis and planning efforts in the future. This recommendation has resulted in the formation of ONE (Office of Neighborhood Empowerment) DeKalb.